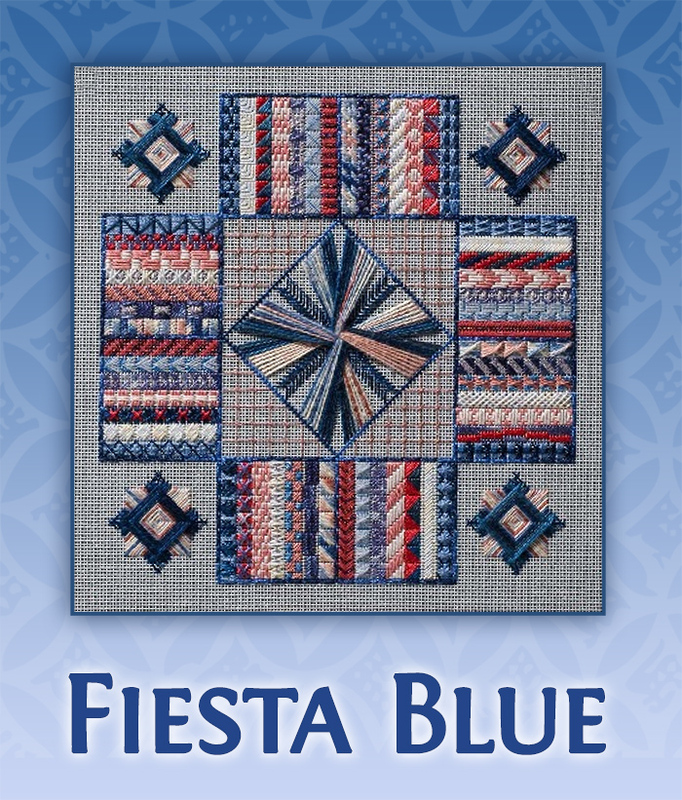 Fiesta Blue is an intermediate-level counted canvas design. What a great way to learn some new stitches! The border is a wonderful ‘blues’ song in stitches based on a quilt border with 56 different bands of stitches around the edges! Do they look random? They aren’t! No one is really comfortable in a geometric piece with being told ‘just do this randomly’. This piece plans ahead for that random effect (Shhh – we won’t tell!). The original colorway is based on Williamsburg Watercolours, but there are seven other colorways detailed in the directions. Each colorway has two coordinating shades of Watercolours, 3 shades of Kreinik #8 braid, 3 shades of ThreadworX #8 pearl cotton, 2 shades of Heathway Merino, 2 shades of Pebbly Perle, plus Crystal Braid, Sparkle!Braid, Tiara and Elegance.